First off, let me say that I absolutely love the rain. I love listening to the rain and I love how everything looks so green afterwards! We have had a lot of rain lately and its supposed to rain some more, and I’m totally okay with that! Because I love the rain so much, I thought this would be the perfect opportunity to draw something to that notion. So, I began to put my pen to the paper and came up with this! Now look closely, do you see that it is made up of several….hundred? thousand? (I don’t know because I didn’t count) dots? There is a little bit of a close up so you can see better. I just love using this technique, called stippling. It adds just a different dimension to the piece as a whole. 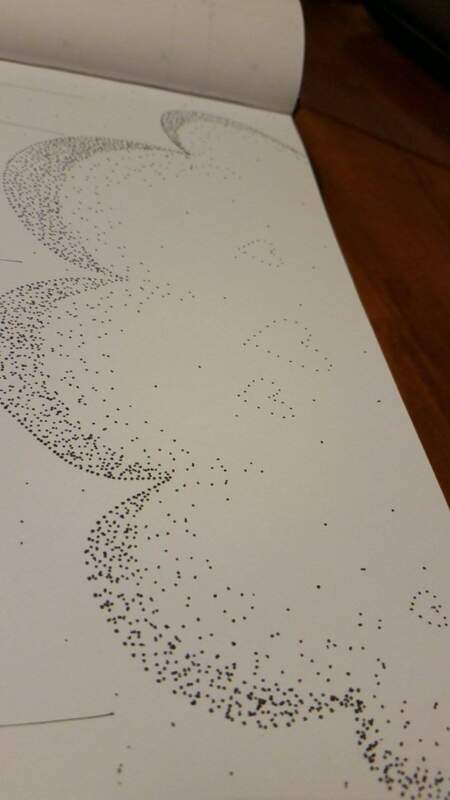 When the dots are closer together it makes a darker line and the more space you give them the lighter the shading gets. Now I am in no way an expert at this, in fact I have only used the technique a handful of times. But I love it and the pigment liners I use for this make it so much easier. I will give one piece of advice, the smaller the tip, the easier it is. For me, I like to use the .01 or even the .005 depending on the size of the piece. I hope you enjoyed the look at this page and I would love your suggestions and comments about your experiences with this technique. Let me know in the comments below! You are so talented! Seeing your drawings reminded me of something long ago forgotten(and I just can’t stop telling you:)), when I was in school and get bored, I was drawing random lines and dots, without any purpose, but at the end of the day I had flowers and castles on my little paper. But I’ve never thought of raining with hearts.. Such a sweet idea!! I love that I am able to share with the world my creative views. Thank you for the confidence in my abilities, it is very inspirational when I am able to bring sweet memories to someone. This would be super adorable as a card… Charity Hallmark designer… I can see it now. You think So? I never thought about making cards. Nice sketch! I love drawing! Thank you for your follow! Thank you for your compliment. I love that you took the time to stop by and take a look around. You’re welcome. Have fun with your daughter!